Summer’s here (or it was yesterday when it was finally warm enough in London for me to take my socks off) and it’s time to try new things. 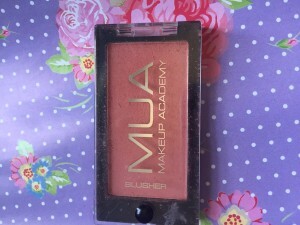 So I’ve got some make-up goodies to review, ready for you to take on holiday. 1. 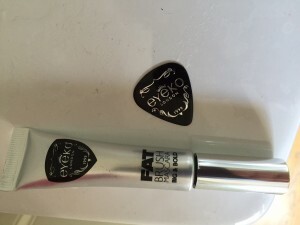 Eyeko Fat Brush Mascara. I was given this as a present by my lovely friend J after she read of my recent mascara travails here. Isn’t that lovely? It’s absolutely brilliant stuff, and I really feel a bit of a twit not knowing about it before. Obviously, J is way cooler than me – though we knew that already. 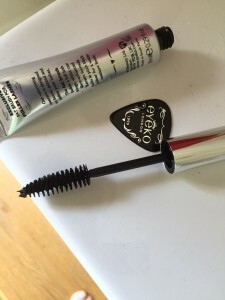 This mascara has it all – witty names (Black Magic, Eye Do), rock star chic (the mascara comes with a little plastic brow guard which could easily double as a plectrum for your electric guitar), celebrity endorsement (Alexa Chung swears by the make). Most important of all, it actually works! The brush definitely has big bones, as promised, the wand comes out gloop-free, the formulation doesn’t itch or flake even in peak hay fever season and it’s a wonderfully dense, intense black. It also comes in a practical toothpaste-style tube so you can squeeze out the last little bit. And it’s British! I love it. I can’t tell you the price as of course it isn’t done to look up how much a present cost, but I will just discreetly point you in the direction of this link. 2. 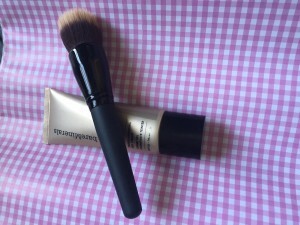 Bare Minerals Complexion Rescue. All right, all right, I definitely don’t need another Bare Minerals product – my bathroom cabinet is groaning with them already. But I couldn’t resist trying Complexion Rescue (£26) as it’s been hailed as an absolute wonder product. An incredible 100 per cent of the tester group (only 63 women in total, but still, that is quite a bunch) reported ‘skin texture improvement’ after a week’s use. It can also be applied with a lovely brush, and I’m a complete sucker for brushes. I consulted with a friendly and helpful assistant at the John Lewis in Bluewater and went for the vanilla, one of ten shades. As with the bareSkin foundation, you only need a weeny blob, about the size of a pea, on the top of your brush. This brush (£24) is less firm than the bareSkin one, so has a bit less of a massaging effect, and the foundation (CC cream, BB cream, tinted moisturiser, whatever you want to call it) has a shinier finish. The more enthusiastic reviewers out there call it ‘dewy’, those not so keen say ‘shiny’. At my age, a bit of a sheen is not a bad thing, so I liked the effect. I am also more obsessed than ever with sun protection and the cream contains SPF 30, Bare Minerals’ highest shield so far. I’m not a total convert to Complexion Rescue yet, because I have had a couple of suspicious break-outs in the days after using the product. Coincidence? Very probably. I’m also pretty devoted to my bareSkin foundation which is a hard act to follow. But I’ll let you know how it goes.